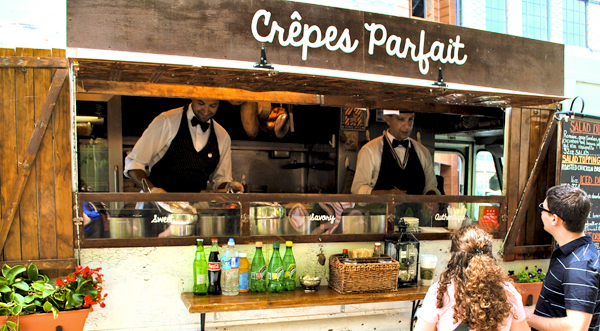 Recently, we headed downtown to Crêpes Parfait’s Washington, DC-based food truck, where the delicious crepes of Chef Mounir Elhilali and his partner, Roberto Catanuso, are made with organic flours and fresh ingredients. One bite and we were inspired to make our own. 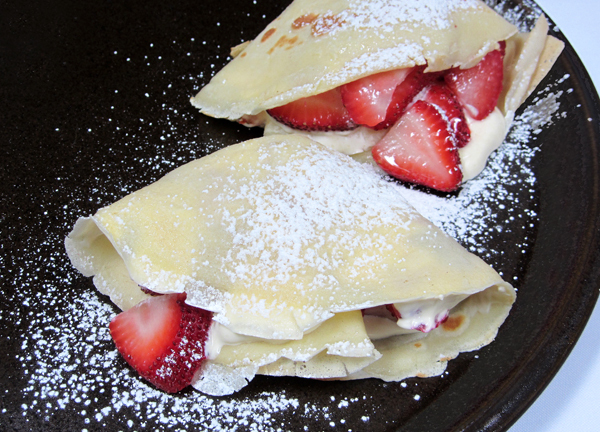 With strawberries in abundance this time of year, these crepes are both simple and sublime, decadent and ethereal. And while perfectly ripe strawberries get a lot of the credit here, this dish would be pretty ordinary without the bright creaminess of the crème fraîche. It is absolutely the perfect complement to their summer sweetness. So, why crème fraîche and not sour cream? In addition to being wonderfully rich and just a bit tangy, this “soured cream” is shockingly versatile, which is a very good thing because one finger-lick and you’ll be hard-pressed to put it down. The amazing thing about crème fraîche is that it doesn’t separate or curdle when heated. It melts and blends seamlessly, bringing flavors together and making them brighter to make one beautiful dish with a complexity of flavors. Use it as a topping for just about any vegetable or dessert or as a garnish for soup. Add just a dollop or two and your potato salads will sing a new tune, shrimp will jump right into their cocktail sauce, and apple pie or fresh fruit will be transformed from good to extraordinary. And don’t forget, crepes can be sweet or savory, filled with anything you’re craving. They can also absolutely be made in advance and warmed in a frying pan, microwave, or oven just before serving, making them a great option when you’re cooking for guests. The Wallaby batch was the thinnest and sweetest of the bunch. The Stoneyfield batch fell in the middle, thicker with a bit more bite than the Wallaby. Horizon Cultured Lowfat Buttermilk produced a thick, rich, and tangy crème fraîche. We liked the batch made with buttermilk best, but really, the others were pretty fantastic, too. The batter is better if you let it rest for an hour or so, but you can also make it in advance, refrigerating it overnight. The batter should be on the thin side but thick enough to coat a spoon. If it’s a little too thick, simply add water or milk a tablespoon at a time. Let the batter come to room temperature before using. This recipe makes enough crème fraîche for about 10-12 crepes or whatever else you’d like! *Place the cream and the buttermilk (or yogurt) in the jar and mix. *That’s it! Loosely cover with a clean kitchen towel or you can rest the jar lid on top but don’t tightened it. *Let the mixture sit at room temperature for 18-24 hours in a warm spot or a turned-off cool oven. Cultures grow best around 75° F. It will thicken and work it’s magic. 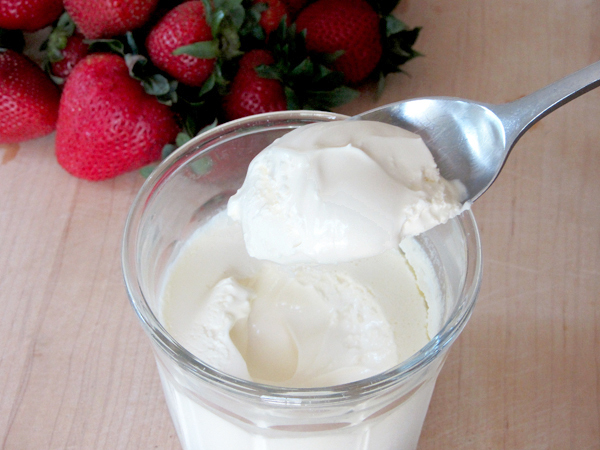 *After the fermentation period, cover the crème fraîche tightly and place in the refrigerator. It will continue to thicken and will keep for at least a week. This recipe made about 10-12 crepes. Use as many as you want and refrigerate or freeze the rest. *Place the water, milk, and eggs in the blender. Follow with the dry ingredients and add the melted butter last. Cover and blend on “liquify” or similar setting for about a minute. Stop and scrape down the sides with your spatula if the flour sticks, then blend for a few seconds more. Your batter should be lump-free. *The batter is better if it rests for an hour at room temperature. If it’s going to be sitting for much longer, you’ll need to refrigerate it. We refrigerated ours overnight so we could cook them in the morning. If you do the same, you’ll need to bring the batter to room temperature before cooking. Add a little water or milk if it’s too thick. *While the batter is warming up or resting, wash, hull, and slice 1 ½ lbs of strawberries or any other fruit of your choice. *Heat your pan over medium heat until hot, then grease the pan lightly with paper towel dipped in oil or use a brush. *Ladle in ¼ cup of batter and immediately lift pan by its handle, tilting and swirling the batter to evenly cover the bottom quickly. Set the pan back down and cook for a minute or so until the underside is light brown when you gently lift the edge with your spatula. 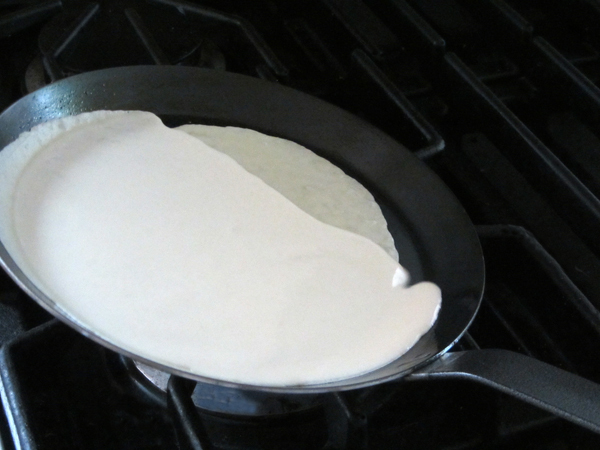 *Loosen the edges of the crepe with the spatula and flip over. *Cook for about 30 seconds and remove the crepe to a plate. *Grease pan again and repeat with the remaining batter until finished. *This whole process will go very quickly. 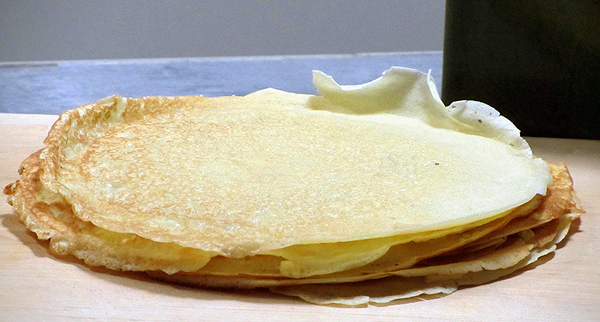 Cover the finished crepes with a clean towel to keep warm as you work. You can also hold them in a 200°F oven. *Spread about 2 generous tbs of crème fraîche on one half of the crepe and top with strawberries. *Fold over the half without toppings and then fold in a half again to form a triangle. You can also roll them up or make a pocket by spooning the filling in the center first and then folding in the sides and the bottom. Don’t think I can leave the C.F. out that long in HK!! !